The Rose Golden Anniversary card with a single golden rose with fern in a stem vase and reflective water created with pearly filament thread. The ‘Happy Anniversary’ greeting is hand-written in gold. 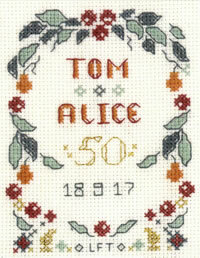 This 50th Wedding Anniversary card will be a fun to create and be warmly received ! Glitzy pearl and gold metallic thread add pizzazz. This Rose Emerald Anniversary card is designed by Lauren Turner for the Decorative Textiles collection.